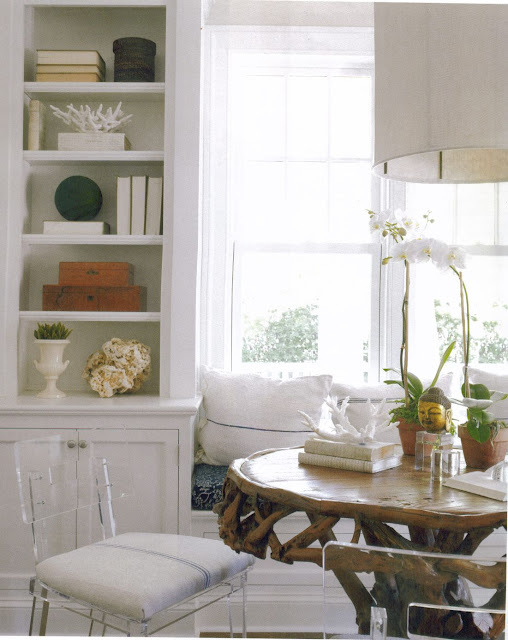 Umm, an amazing driftwood table paired with feed sack covered Lucite chairs?!?! 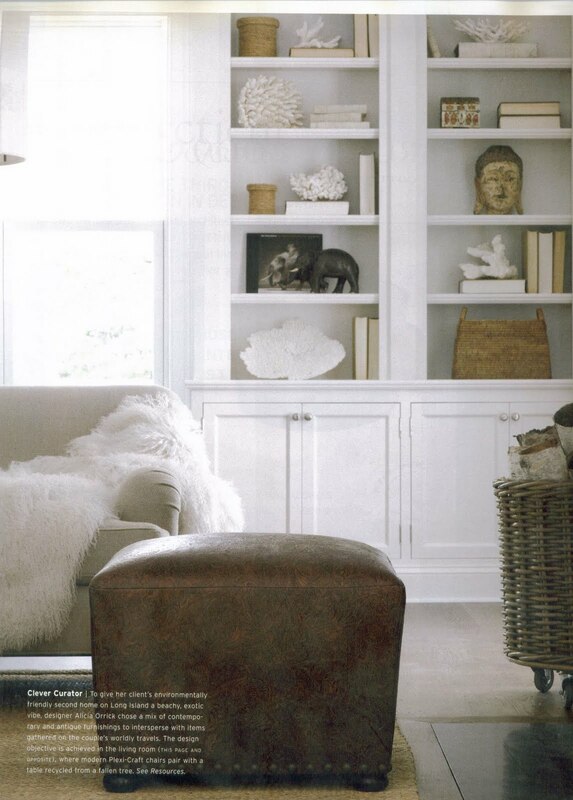 Not to mention the drum shade lighting and the cozy window seat, or perfectly styled bookshelves. 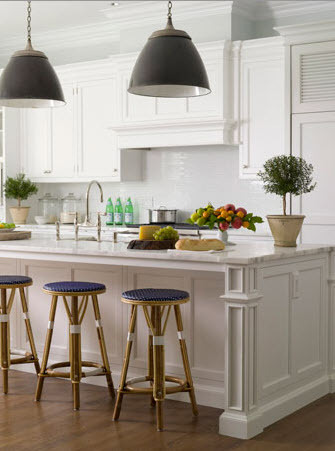 Hello lovely kitchen- can I move in? The work of Alicia Orrick is why I didn't throw the magazine away, and I am so glad I didn't. The home in Darien, CT is a memorable one with a mix of antique & new and traditional & modern, all tied in with a cool beachy feel. 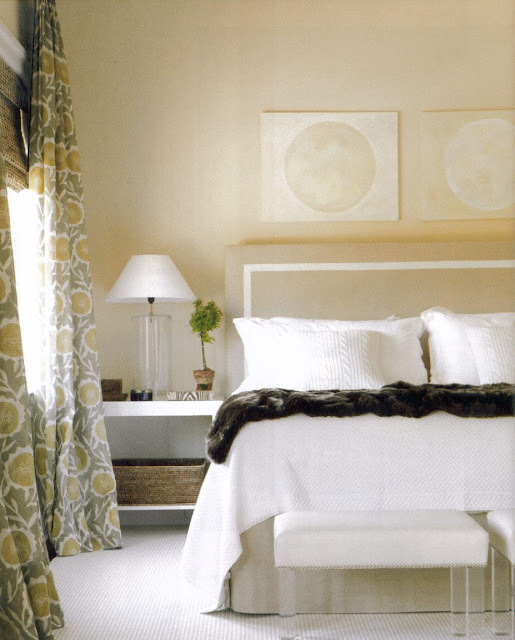 The last bedroom is my favorite- the curtains, side table, lamp, pair of Lucite benches, fur throw and headboard are so delish. Also, do I spy an I Married Adventure book on the side table? I think I do! I am so glad I didn't throw this one away! Do you keep stacks and stacks of magazines too? Oh of course, and every week Rob asks me when I'm getting rid of them! I love CT Cottages and Gardens and always pick it up when I'm at the future in-laws! Hope the planning is going well! I have like a bazillion magazines! I love that first picture with the lucite chairs. Magazines are a great way to thumb through inspiration....pages upon pages of great examples. Oh you always have such a great stash of magazines to go through. I have a ton of them and they are hidden all throughout my house! Just drooled in my coffee! 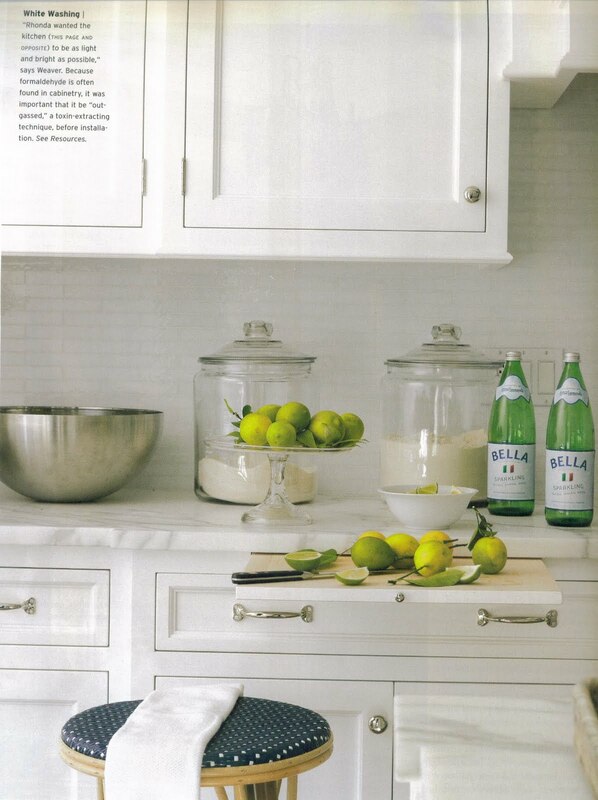 And how is it that green glass bottles act like decor when they are really just sparkling water. Love it. Ugghhh I never know how to store my magazines! PS- love that pop of red in the coral chandelier! Lovely! Love those stools at the end of the bed in that last picture! Ooooh, gorgeous, I'm so glad you didn't throw it away! Love that beachy feel! oooh yes please, this is like my dream home!!! fab! well done n keeping them! I'm feeling like I should subscribe to this mag! I adore Orrick and co, they are so talented. I do have some stacks and then I try to edit and organize them...I always love when I find something -that makes me happy that I saved it! that mag's a keeper, fo sho! Lots of classic looks you'll be able to refer to years from now. what delicious eye candy! don't you love when you find little treats like this around the house? Thanks for sharing with us! Well ..... drool. Drool. Love your blog, just found it! I LOVE that top picture with the wooden table and I also REALLY want that wire chair!! I keep so many old magazines. Just need to find a way to organize them. But they have come in handy since I have been on bedrest ... some just never get old to look at! I have waaaaay too many magazines!! I desperately need to go through and edit them. I keep thinking that one of these days I'm going to go through and start an inspiration binder with all the images that I love, torn out and organized by room/color/look, etc. I'm not sure that it will ever happen... but I keep thinking it will! These are beautiful!! And I love your description of the first image - it's like everything but the kitchen sink thrown in there, but it works! I love all of these rooms. The large hanging lights in the first few pictures are AMAZING! Why can't my home look like this. Seriously, I think I need several homes to play around with. One like this and one like that...oh and another and another. 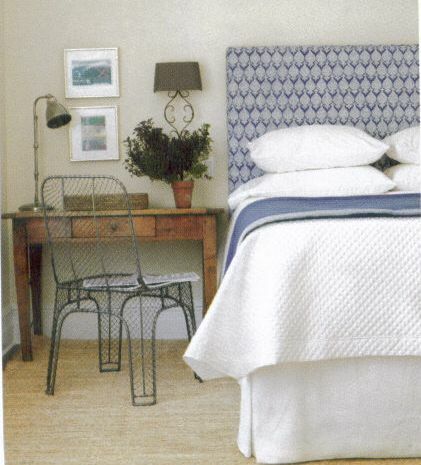 I also love that dark ottoman in the very light room....perfection! I love the bedroom as well! 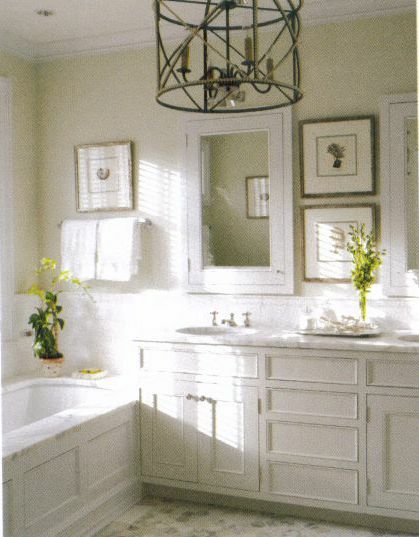 The soft palette with the pop of pattern from the panels is just perfect for a BR! Ask my hubs about my glossy collection...It's OUTTA CONTROL! Ah ha ha. 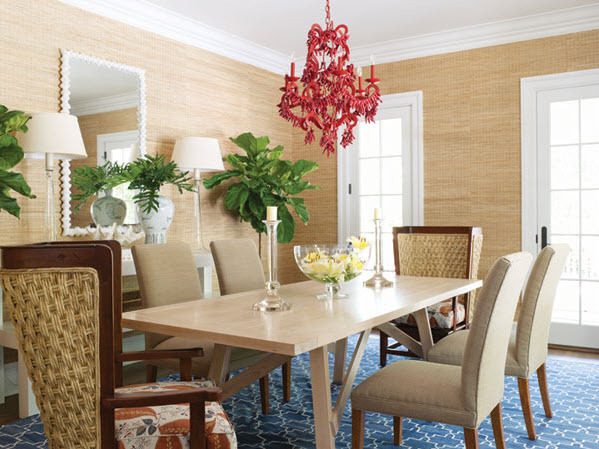 That coral chandelier is incredible! I love love love that last bedroom with the suzani-like floral drapes. The bedroom is neutral but has just enough color to make it pop. loveth these. I am bookmarking. just in case you were wondering, I love that top image and I want a little topiary by my bedside like in the bottom picture. Photographs like these make me want to tear everything out of my apartment and start over. I keep stacks of magazines and then after I run out of storage I rip out my favorites and put them in a 3 ring binder. I think that I now have about 7 such binders.